It’s here. It is finally marathon weekend!! And the marathon is in two days. TWO DAYS!! After 110 days and almost exactly 16 weeks of training, the moment of truth is here. First of all, I apologize (not really) for all of the marathon talk. It is honestly all I have on my mind. I know it’s been coming up and I knew my days were numbered on when I would get to stand on that line, but it didn’t hit me hard until last night. There may have been a few extra tears in dinner, and they weren’t from cutting an onion. It’s crazy to think that I’m running the “ultimate” event, at least that’s how I see it. What is more unbelievable is that last May I ran my first half marathon. In the past 17 months I’ve run 8 half marathons and will now get to reach the next level. I’ve set out some goals. Nothing too crazy, but something to think about when I reach a low point or two during the race. Finish in 4:30. This may be a lofty goal, but it’s a best case scenario for sure. This puts me at a 10:15ish pace, a 2:15 half. A majority of my miles in my long runs have been sub 10, so I f eel like this is a possibility. But there is no guarantee on race day and I know I have to keep my pace slow. Finish in 4:45. This is the finish time for my corral. I think this is a safe goal, it gives me extra time and I’d have a pace of 11:00. I never ran this pace during training, but I have a feeling that I may dip down to it in my final miles. Finish. In all honesty, I just want to finish. I want to cross that line and become a marathoner. This is one of the most important days of my life, crossing that line is all I can think about. It means more than anything to me. Now you know my goals, but what if you want to see how I’m doing during the race instead of waiting for my race recap? No worries, I’ve got you covered. I’ve linked up my Twitter account to check in on my splits throughout the race with Real-Time Race Tracking. You can also come to Columbus and be one of the awesome fans. 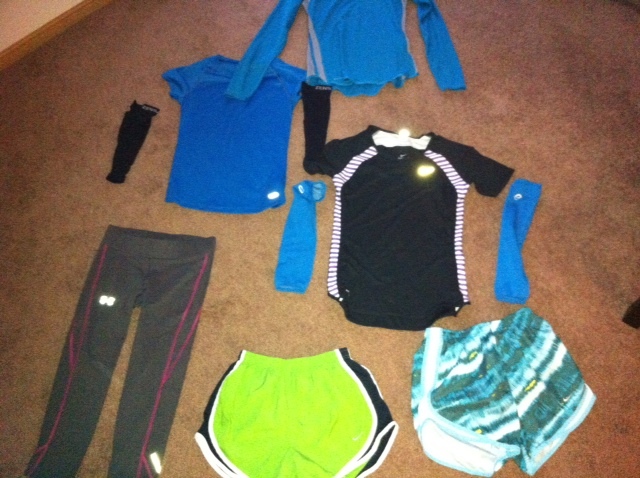 I’ll be wearing something from the assortment below…. Goals. Check. Tracking. Check. Thank you’s…. I wish I could take each and every person out to dinner to thank them for all they’ve done, instead I’ll let you know on here. Plus I can save money for the expo. Seriously, I wouldn’t have been able to come this far with out the support, encouragement, hope and love from everyone. Friends, family, blog readers, twitter followers, you guys are all amazing. All the comments, well wishes, advice, I’ve taken it all to heart and will think about each and every one of you on Sunday. I can’t wait to come back next week and share the experience with you, the ups and downs, the tears and smiles. Every single moment. So thank you. It’s time, time to leave it all on the streets of Columbus and give this marathon everything I’ve got. Congratulations on completing your first full marathon, Chels! We are very proud of you for accomplishing this goal! Love ya! !